The Great Kantō earthquake (関東大地震, Kantō dai-jishin) struck the Kantō Plain on the Japanese main island of Honshū at 11:58:44 JST (02:58:44 UTC) on Saturday, September 1, 1923. Varied accounts indicate the duration of the earthquake was between four and ten minutes. The earthquake had a magnitude of 7.9 on the moment magnitude scale (Mw ), with its focus deep beneath Izu Ōshima Island in Sagami Bay. 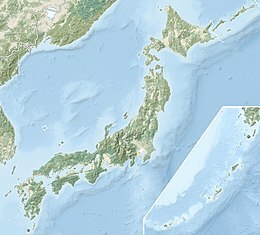 The cause was a rupture of part of the convergent boundary where the Philippine Sea Plate is subducting beneath the Okhotsk Plate along the line of the Sagami Trough. This earthquake devastated Tokyo, the port city of Yokohama, and the surrounding prefectures of Chiba, Kanagawa, and Shizuoka, and caused widespread damage throughout the Kantō region. The earthquake's force was so great that in Kamakura, over 60 km (37 mi) from the epicenter, it moved the Great Buddha statue, which weighs about 93 short tons (84 t), almost two feet. Estimated casualties totaled about 142,800 deaths, including about 40,000 who went missing and were presumed dead. According to the Japanese construction company Kajima Kobori Research's conclusive report of September 2004, 105,385 deaths were confirmed in the 1923 quake. The damage from this natural disaster was one of the greatest sustained by Imperial Japan. In 1960, the government declared September 1, on the 37th anniversary of the quake, as an annual "Disaster Prevention Day". Because the earthquake struck at lunchtime when many people were cooking meals over fire, many people died as a result of the many large fires that broke out. Some fires developed into firestorms[better source needed] that swept across cities. Many people died when their feet became stuck on melting tarmac. 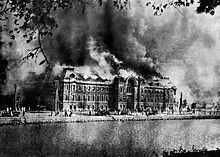 The single greatest loss of life was caused by a fire tornado that engulfed the Rikugun Honjo Hifukusho (formerly the Army Clothing Depot) in downtown Tokyo, where about 38,000 people were incinerated after taking shelter there following the earthquake. The earthquake broke water mains all over the city, and putting out the fires took nearly two full days until late in the morning of September 3. A strong typhoon centered off the coast of the Noto Peninsula in Ishikawa Prefecture brought high winds to Tokyo Bay at about the same time as the earthquake. These winds caused fires to spread rapidly. The Emperor and Empress were staying at Nikko when the earthquake struck Tokyo, and were never in any danger. Many homes were buried or swept away by landslides in the mountainous and hilly coastal areas in western Kanagawa Prefecture; about 800 people died. A collapsing mountainside in the village of Nebukawa, west of Odawara, pushed the entire village and a passenger train carrying over 100 passengers, along with the railway station, into the sea. A tsunami with waves up to 10 m (33 ft) high struck the coast of Sagami Bay, Bōsō Peninsula, Izu Islands, and the east coast of Izu Peninsula within minutes. The tsunami caused many deaths, including about 100 people along Yui-ga-hama Beach in Kamakura and an estimated 50 people on the Enoshima causeway. Over 570,000 homes were destroyed, leaving an estimated 1.9 million homeless. Evacuees were transported by ship from Kantō to as far as Kobe in Kansai. The damage is estimated to have exceeded US$1 billion (or about $15 billion today). There were 57 aftershocks. Ethnic Koreans were massacred after the earthquake. Ethnic Koreans were massacred after the earthquake. The Home Ministry declared martial law and ordered all sectional police chiefs to make maintenance of order and security a top priority. A false rumor was spread that Koreans were taking advantage of the disaster, committing arson and robbery, and were in possession of bombs. Anti-Korean sentiment was heightened by fear of the Korean independence movement. In the confusion after the quake, mass murder of Koreans by mobs occurred in urban Tokyo and Yokohama, fueled by rumors of rebellion and sabotage. The government reported 231 Koreans were killed by mobs in Tokyo and Yokohama in the first week of September. Independent reports said the number of dead was far higher, ranging from 6,000 to 10,000. Some newspapers reported the rumors as fact, including the allegation that Koreans were poisoning wells. The numerous fires and cloudy well water, a little-known effect of a large quake, all seemed to confirm the rumors of the panic-stricken survivors who were living amidst the rubble. Vigilante groups set up roadblocks in cities, and tested residents with a shibboleth for supposedly Korean-accented Japanese: deporting, beating, or killing those who failed. Army and police personnel colluded in the vigilante killings in some areas. Of the 3,000 Koreans taken into custody at the Army Cavalry Regiment base in Narashino, Chiba Prefecture, 10% were killed at the base, or after being released into nearby villages. Moreover, anyone mistakenly identified as Korean, such as Chinese, Ryukyuans, and Japanese speakers of some regional dialects, suffered the same fate. About 700 Chinese, mostly from Wenzhou, were killed. A monument commemorating this was built in 1993 in Wenzhou. In response, the government called upon the Japanese Army and the police to protect Koreans; 23,715 Koreans were placed in protective custody across Japan, 12,000 in Tokyo alone. The chief of police of Tsurumi (or Kawasaki by some accounts) is reported to have publicly drunk the well water to disprove the rumor that Koreans had been poisoning wells. In some towns, even police stations into which Korean people had escaped were attacked by mobs, whereas in other neighbourhoods, residents took steps to protect them. The Army distributed flyers denying the rumor and warning civilians against attacking Koreans, but in many cases vigilante activity only ceased as a result of Army operations against it. In several documented cases, soldiers and policemen participated in the killings, and in other cases authorities handed groups of Koreans over to local vigilantes, who proceeded to kill them. Amidst the mob violence against Koreans in the Kantō Region, regional police and the Imperial Army used the pretext of civil unrest to liquidate political dissidents. 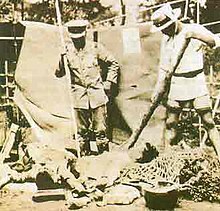 Socialists such as Hirasawa Keishichi [ja] (平澤計七), anarchists such as Sakae Ōsugi and Noe Itō, and the Chinese communal leader, Ō Kiten [ja] (王希天), were abducted and killed by local police and Imperial Army, who claimed the radicals intended to use the crisis as an opportunity to overthrow the Japanese government. Director Chongkong Oh made two documentary films about the pogrom: Hidden Scars: The Massacre of Koreans from the Arakawa River Bank to Shitamachi in Tokyo (1983) and The Disposed-of Koreans: The Great Kanto Earthquake and Camp Narashino (1986). They largely consist of interviews with survivors, witnesses and perpetrators. The importance of obtaining and providing accurate information following natural disasters has been emphasized in Japan ever since. Earthquake preparation literature in modern Japan almost always directs citizens to carry a portable radio and use it to listen to reliable information, and not to be misled by rumors in the event of a large earthquake. Following the devastation of the earthquake, some in the government considered the possibility of moving the capital elsewhere. Proposed sites for the new capital were even discussed. Japanese commentators interpreted the disaster as an act of divine punishment to admonish the Japanese people for their self-centered, immoral, and extravagant lifestyles. In the long run, the response to the disaster was a strong sense that Japan had been given an unparalleled opportunity to rebuild the city, and to rebuild Japanese values. In reconstructing the city, the nation, and the Japanese people, the earthquake fostered a culture of catastrophe and reconstruction that amplified discourses of moral degeneracy and national renovation in interwar Japan. After the earthquake, Gotō Shinpei organized a reconstruction plan of Tokyo with modern networks of roads, trains, and public services. Parks were placed all over Tokyo as refuge spots, and public buildings were constructed with stricter standards than private buildings to accommodate refugees. The outbreak of World War II and subsequent destruction severely limited resources. Memorial service for foreigners who died at the earthquake: The woman burning incense is the wife of the Italian Ambassador to Japan. The venue is Zōjō-ji in Shiba Park. Frank Lloyd Wright received credit for designing the Imperial Hotel, Tokyo, to withstand the quake, although in fact the building was damaged by the shock. The destruction of the US embassy caused Ambassador Cyrus Woods to relocate the embassy to the hotel. Wright's structure withstood the anticipated earthquake stresses, and the hotel remained in use until 1968. The unfinished battlecruiser Amagi was in drydock being converted into an aircraft carrier in Yokosuka in compliance with the Washington Naval Treaty of 1922. The earthquake damaged the ship's hull beyond repair, leading it to be scrapped, and the unfinished fast battleship Kaga was converted into an aircraft carrier in its place. The fire clouds over Kantō, as seen from some distance away. In contrast to London, where typhoid fever had been steadily declining since the 1870s, the rate in Tokyo remained high, more so in the upper-class residential northern and western districts than in the densely populated working-class eastern district. An explanation is the decline of waste disposal, which became particularly serious in the northern and western districts when traditional methods of waste disposal collapsed due to urbanization. The 1923 earthquake led to record-high morbidity due to unsanitary conditions following the earthquake, and it prompted the establishment of antityphoid measures and the building of urban infrastructure. The Honda Point Disaster on the United States west coast, in which seven US Navy destroyers ran aground and 23 lives were lost, has been attributed to navigational errors caused by unusual currents set up by the earthquake in Japan. Beginning in 1960, every September 1 is designated as Disaster Prevention Day to commemorate the earthquake and remind people of the importance of preparedness, as August and September are the peak of the typhoon season. Schools and public and private organizations host disaster drills. Tokyo is located near a fault zone beneath the Izu Peninsula which, on average, causes a major earthquake about once every 70 years, and is also located near the Sagami Trough, a large subduction zone that has potential for large earthquakes. Every year on this date, schools across Japan take a moment of silence at the precise time the earthquake hit in memory of the lives lost. Some discreet memorials are located in Yokoamicho Park in Sumida Ward, at the site of the open space in which an estimated 38,000 people were killed by a single fire tornado. The park houses a Buddhist-style memorial hall/museum, a memorial bell donated by Taiwanese Buddhists, a memorial to the victims of World War II Tokyo air raids, and a memorial to the Korean victims of the vigilante killings. Maurice Tourneur's 1924 silent film Torment has an earthquake in Yokohama in its plot, and uses footage of the Kantō earthquake in the film. In Yasunari Kawabata's 1930 novel The Scarlet Gang of Asakusa several chapters deal with the Great Kantō earthquake. In Japan Sinks, in one scene in the book, due to the fast-moving subduction of the Pacific and Eurasian plates, the Sagami Trough ruptures in a magnitude-8.5 earthquake, killing several million people in Tokyo and other areas, causing major tsunamis, and creating major firestorms. In the film adaptation of Japan Sinks, Nihon Chinbotsu, the Sagami Trough ruptures in a massive earthquake called "The Second Great Kanto Earthquake". In the manga (comic) adaptation of Japan Sinks, the Second Kantō Earthquake killed over five million. In the historical fantasy novel Teito Monogatari (Hiroshi Aramata) a supernatural explanation is given for the cause of the Great Kantō earthquake, connecting it with the principles of feng shui. In Oswald Wynd's novel The Ginger Tree, Mary Mackenzie survives the earthquake, and later bases her clothes designing company in one of the few buildings that remained standing in the aftermath. In Tokyo Magnitude 8.0, the Sagami Trough ruptures in a magnitude-8.0 earthquake, killing over 200,000 in Tokyo, causing floods and fires, and putting the main character at risk. Waki Yamato's manga Haikara-san ga Tōru actually reaches its climax after the Great Kantō earthquake—which happens right before the wedding of the female lead, Benio Hanamura, and her second love Tousei. Benio barely survives when the Christian church she's getting married in collapses, and then she finds her long-lost love Shinobu whose other love interest Larissa is among the victims; they get back together, and Tousei allows them to. The josei manga and anime Kasei Yakyoku (by author Makiko Hirata) also finishes few after the earthquake, as a corollary to the main love triangle between the noblewoman Akiko Hashou, her lover Taka Itou, and Akiko's personal maid Sara Uchida. It happens right as the marriage between Akiko and her fiancè Kiyosu Saionji is announced, Sara is in the streets, and Taka is taking Sara's brother Junichirou (who had been injured in a yakuza-related incident) to a hospital. The Hashou's mansion is destroyed, leading to an emotional confrontation between Akiko and Saionji; meanwhile, Sara's humble house in the suburbia is also destroyed and her and Junichirou's mother dies of injuries she sustained in the earthquake. In Urotsukidōji, the confrontation between Amano Jyaku and Suikakujyu with a water demon triggers the 1923 earthquake. The josei manga Akatsuki no Aria (by Michiyo Akaishi) features the earthquake in volume 8. Several places frequented by the protagonist Aria Kanbara, like her boarding school and the house of the rich Nishimikado clan that she is an illegitimate member of, become shelters for the wounded and the homeless. Aria's birth mother is severely injured by debris and dies few later, and this triggers a subplot about Aria's own heritage. In the 2013 animated film by director Hayao Miyazaki, The Wind Rises, the protagonist Jiro Horikoshi is traveling to Tokyo by train to study engineering. On the way, the 1923 earthquake strikes, damaging the train and causing a huge fire in the city. In the 2017 josei manga Fushigi Yûgi Byakko Senki (by Yuu Watase), the heroine Suzuno Osugi enters The Universe of the Four Gods for the first time right after the earthquake: her father Takao, who is dying from injuries he suffered when the family house fatally collapsed on him and Suzuno's mother Tamayo, orders her to do so, so she will survive the disaster and its aftermath. After a brief time there, she's sent back to the already destroyed Tokyo and she, alongside her soon-to-be love interest Seiji Horie and two young boys named Hidero and Kenichi, are taken in by a friend of the late Takao, Dr. Oikawa. ^ Kobayashi, Reiji; Koketsu, Kazuki (2005). "Source process of the 1923 Kanto earthquake inferred from historical geodetic, teleseismic, and strong motion data". Earth, Planets and Space. 57 (4): 261. Bibcode:2005EP&S...57..261K. doi:10.1186/BF03352562. ^ Panda, Rajaram. "Japan Coping with a National Calamity". Delhi: Institute for Defence Studies and Analyses (IDSA). Retrieved 21 December 2011. ^ Kanamori, Hiroo (1977). "The energy release in great earthquakes" (PDF). J. Geophys. Res. 82 (20): 2981–2987. Bibcode:1977JGR....82.2981K. doi:10.1029/JB082i020p02981. ^ Namegaya, Yuichi; Satake, Kenji; Shishikura, Masanobu (2011). "Fault models of the 1703 Genroku and 1923 Taisho Kanto earthquakes inferred from coastal movements in the southern Kanto erea" (PDF). Retrieved 27 September 2015. ^ Usami, Tatsuo『最新版 日本被害地震総覧』 p272. ^ Hatori, Tokutaro. "Tsunami Behavior of the 1923 Kanto Earthquake at Atami and Hatsushima Island in Sagami Bay". Archived from the original on 29 September 2015. Retrieved 27 September 2015. ^ Takemura, Masayuki (1994). "Aftershock Activities for Two Days after the 1923 Kanto Earthquake (M=7.9) Inferred from Seismograms at Gifu Observatory". Retrieved 27 September 2015. ^ Takemura, Masayuki; Moroi, Takafumi (2004). "Mortality Estimation by Causes of Death Due to the 1923 Kanto Earthquake". Journal of Jaee. 4 (4): 21–45. doi:10.5610/jaee.4.4_21. ^ "Today in Earthquake History". Retrieved 15 April 2016. ^ James, Charles. "The 1923 Tokyo Earthquake and Fire" (PDF). University of California, Berkeley. Archived from the original (PDF) on 16 March 2007. Retrieved 21 December 2011. ^ "Most Destructive Earthquakes". U.S. Geological Survey. Archived from the original on 2009-11-02. Retrieved 2013-02-18. ^ Bakun, W.H. (2005). "Magnitude and location of historical earthquakes in Japan and implications for the 1855 Ansei Edo earthquake" (PDF). Journal of Geophysical Research. 110 (B02304). Bibcode:2005JGRB..11002304B. doi:10.1029/2004JB003329. ^ "The 1923 Tokyo Earthquake". Archived from the original on November 9, 2001. Retrieved 2007-02-22. ^ Thomas A. Stanley & R.T.A. Irving (2001-09-05). "The 1923 Kanto Earthquake". Archived from the original on 2007-03-04. Retrieved 2007-02-22. ^ James, Charles D. (2002-10-08). "The 1923 Tokyo Earthquake and Fire" (PDF). Archived from the original (PDF) on 16 March 2007. Retrieved 2007-02-22. ^ "The Earthquake and Fires - The Great Kantō Earthquake.com". www.greatkantoearthquake.com. ^ "The Great Kanto Earthquake of 1923". library.brown.edu. ^ Taylor, Alan. "1923 Kanto Earthquake: Echoes From Japan's Past". ^ Scawthorn; Eidinger; Schiff, eds. (2005). Fire Following Earthquake. Reston, Virginia: ASCE, NFPA. ISBN 978-0-7844-0739-4. Archived from the original on 2013-09-28. Retrieved 2012-07-26. ^ "Yokohama is Practically Destroyed". The New York Times. September 3, 1923. ^ "Collection of 1923 Japan earthquake massacre testimonies released". Retrieved 2018-04-21. ^ "Ethnic Korean filmmaker ends 30-year hiatus to tackle massacre：The Asahi Shimbun". The Asahi Shimbun. Retrieved 2018-04-21. ^ a b c "朝鮮人虐殺事件" [Korean Massacre Incident]. Kokushi Daijiten (in Japanese). Tokyo: Shogakukan. 2012. OCLC 683276033. Archived from the original on 2007-08-25. Retrieved 2012-08-11. ^ Chuushichi Tsuzuki (2000). The Pursuit of Power in Modern Japan, 1825–1995. Oxford University Press. p. 216. ^ Neff, Robert. "The Great Kanto Earthquake Massacre". Archived from the original on 2 December 2013. Retrieved 29 August 2013. ^ "The Great Kanto Earthquake of 1923". Library.brown.edu. Retrieved 2013-02-18. ^ "日本１９２３年关东大地震 在日朝鲜人和华工为何地震后惨遭屠杀". Elite Reference. 2008-05-27. Archived from the original on 2008-06-25. Retrieved 2008-06-25. ^ "日本暴徒残害温州人的历史记录 ——写在"东瀛血案"八十周年". Wenzhou Daily. 2003-09-06. Archived from the original on 2014-06-07. Retrieved 2014-06-08. ^ a b c "亀戸事件" [Kameido Incident]. Kokushi Daijiten (in Japanese). Tokyo: Shogakukan. 2012. OCLC 683276033. Archived from the original on 2007-08-25. Retrieved 2012-08-11. ^ Choongkong Oh (Director) (1983). 隠された爪跡 – 東京荒川土手周辺から下町の虐殺 [Hidden Scars: The Massacre of Koreans from the Arakawa River Bank to Shitamachi in Tokyo] (Motion picture). ^ Choongkong Oh (Director) (1986). 払い下げられた朝鮮人-関東大震災と習志野収容所 [The Disposed-of Koreans: The Great Kanto Earthquake and Camp Narashino] (Motion picture). ^ Funabashi, Yoichi (2011-07-04). "Rebuilding Japan". Time. Retrieved 23 December 2011. ^ Nagashima, Takeshi (2004). "Sewage Disposal and Typhoid Fever: the Case of Tokyo 1912–1940". Annales de Démographie Historique. 2 (1): 105–117. doi:10.3917/adh.108.0105. ^ Waldman, Harry (2001). "The Films in America, 1914–1926". Maurice Tourneur: The Life and Films. Jefferson, NC: McFarland & Co. p. 117. ISBN 9780786409570. ^ "Nightsong of Splendor — Kasei Yakyoku". Retrieved 11 December 2011. Borland, Janet (October 2006). "Capitalising on catastrophe: reinvigorating the Japanese state with moral values through education following the 1923 Great Kantō Earthquake". Modern Asian Studies. 40 (4): 875–907. doi:10.1017/S0026749X06002010. JSTOR 3876637. Borland, Janet (May 2005). "Stories of ideal Japanese subjects from the great Kantō earthquake of 1923". Japanese Studies, Special Issue: Modern Japanese History. 25 (1): 21–34. doi:10.1080/10371390500067645. Clancey, Gregory (2006). Earthquake nation: the cultural politics of Japanese Seismicity. Berkeley: University of California Press. ISBN 9780520246072. Helibrun, Jacob (September 17, 2006). "Aftershocks". The New York Times. Lee, Eun-gyong (January 2015). "The Great Kantō Earthquake and "life-rationalization" by modern Japanese women". Asian Journal of Women's Studies. 21 (1): 2–18. doi:10.1080/12259276.2015.1029230. Nyst, M.; Nishimura, T.; Pollitz, F. F.; Thatcher, W. (November 2006). "The 1923 Kantō earthquake reevaluated using a newly augmented geodetic data set". Journal of Geophysical Research. 111 (B11306): n/a. Bibcode:2006JGRB..11111306N. doi:10.1029/2005JB003628. Pdf. Scawthorn, Charles; Eidinger, John M.; Schiff, Anshel J. (2006). Fire following earthquake. Reston, Virginia: American Society of Civil Engineers. ISBN 9780784407394. Schencking, J. Charles (Summer 2008). "The Great Kantō Earthquake and the culture of catastrophe and reconstruction in 1920s Japan". Journal of Japanese Studies. 34 (2): 295–331. doi:10.1353/jjs.0.0021. Wikimedia Commons has media related to 1923 Great Kantō earthquake.